Watching a weather forecast before land applying manure can reduce your neighbors’ odor exposure. Photo credit Rick Koelsch. 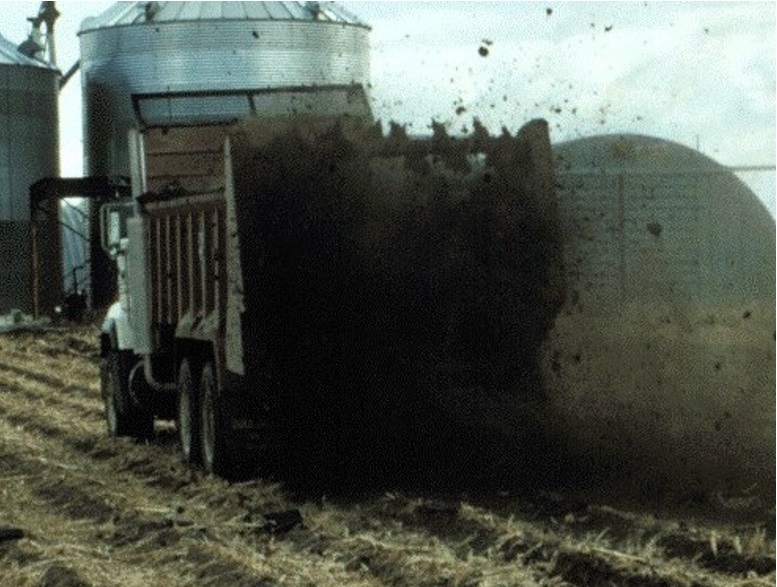 Incorporation of manure into the soil is always the “best” practice for controlling odor. Soil is an excellent filter for removing odors released by manure. However, maintaining residue cover for protecting soil quality and erosion and conserving water does not always allow for manure to be incorporated. When manure cannot be incorporated, the next 36-hour period after land-applying manure is the most critical. Why? Good drying conditions over the next two days can significantly reduce the release of odors. In addition, the next two evenings are the most likely time when neighbors will experience manure’s odors. Especially, when applying manure without incorporating it, pay close attention to the next 36-hour weather forecast. Wind direction is the single most critical information for selecting fields. Odor plumes travel in the same direction as wind and spread out laterally very little. By identifying the edges of the field perpendicular to the wind and the wind’s direction, one can quickly identify the neighbors at greatest risk and those unlikely to be impacted. For the two land application site options illustrate in Figure 1 (Field A and B), Field A presents a much smaller risk to nearby neighbors. By choosing a land application site ½ mile to the north for this southwest wind, the risk has been dramatically reduced in this example. Paying attention to the wind directional forecast for a 36-hour period after applying manure, one can gauge the risk of odor affecting neighbors. Can you recall a time when you observed a smoke cloud hanging near the ground? Often this is observed as air temperatures are cooling and when winds are light, most commonly occurs during evening and nighttime hours. Under these conditions the smoke is not being diluted and is being held near the ground for all to experience. Although we cannot see odors, the exact same atmospheric conditions create the greatest risk for neighbors experiencing odors (Table 1). Under daytime conditions, odor plumes are generally rising, being diluted with fresh air to where odors are unlikely to be noticed by your neighbors. Bright sunshine and warming air is best for dispersing odors. Higher wind speeds (especially at night) also encourage greater mixing of fresh and odorous air, and reducing the odor risk. Note that nighttime hours with low wind speeds are the conditions most likely to expose neighbors to odors from land application. Your weather forecast should now appear for a three day period. Note: you may have to scroll down the page to see your report. Weather forecasts that provide 1) wind direction and speed; 2) sky conditions, and 3) temperature can be extremely valuable in deciding when and where to apply manure. Many weather services provide this information in their forecasts. Aviation Weather Report and Forecast (Figures 2 and 3) shares the important forecast information in an easily reviewed visual format. For the Columbus Nebraska forecast (Figure 2), note that nighttime conditions will be producing higher risks for neighbors for the immediate future. No extended periods of good drying conditions are available before the high risk night conditions occur. Thus, if waiting for more desirable weather conditions is not a choice, what is my best option under these conditions? Note the forecast nighttime wind direction and use this information to select a land application site with the fewest downwind residences (mainly to the south and east in this example). The weather forecast for Sidney (Figure 3) suggests that neighbors to the north of a land application site on July 20 are at risk for odor. Spreading manure on July 19 and 20 should be avoided if neighbors reside to the north. Conditions for applying manure are more favorable on July 21 for good drying conditions and nighttime conditions that will disperse odors quickly. July 21 might be a good day for manure application on fields with greater neighbor pressure. Picking the right weather conditions for land applying manure, may not improve your popularity in the community, but it can go along way with improving your community’s acceptance of livestock systems. Pasquill, F., The Estimation of the Dispersion of Windborne Material, The Meteorological Magazine, Vol. 90, No. 1063 (1961).